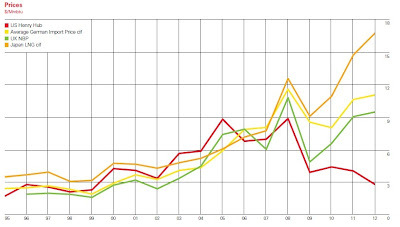 Here are some patterns in world energy markets that caught my eye, taken from the just-released BP Statistical Review of World Energy 2013. 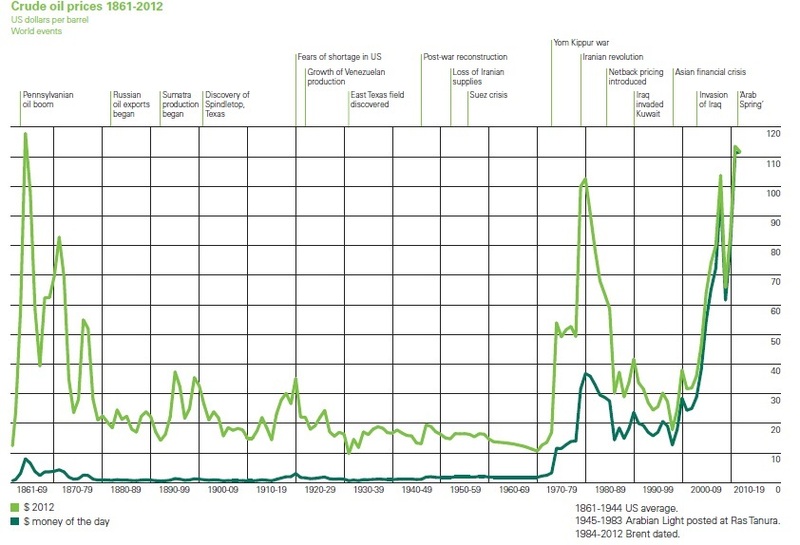 For starters, here's the long-run pattern of world oil prices. The top line is the relevant one, because the prices are adjusted to 2012 dollars. To me, the striking pattern is that real oil prices are at their all-time high since the Pennsylvania oil boom of the 1860s added enough supply to bring real oil prices down. 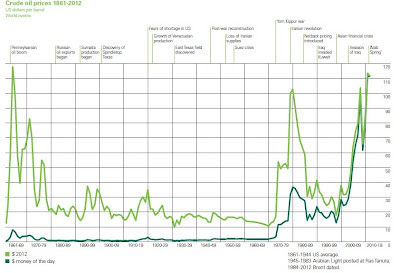 The severity of the price shocks of the mid- and late 1970s stand out here. but the increase in oil prices since about 2000 is also striking. Even in a U.S. economy that relies more on services and information than on old-style heavy manufacturing, this price increase must be contributing to the economic sluggishness of the last few years. What about natural gas prices? The time series here doesn't go back so far: only to 1995. What's interesting to me here is that natural gas prices around the world move more-or-less in harmony up to about 2008. But since then, natural gas prices in the U.S. have dropped and stayed down, while those in Germany, the UK, and Japan dropped in the recession but have since increased. Natural gas is not (yet?) a unified world market, because it cannot be cheaply transported in volume around the world. Thus, the recent increases in unconventional natural gas production in North America have brought down prices here, but not in the rest of the world. Global coal production grew by 2%. 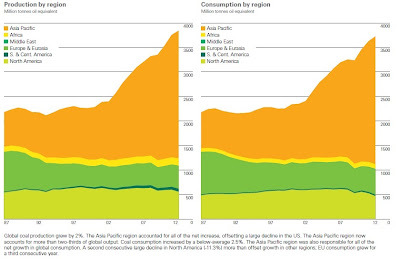 The Asia Pacific region accounted for all of the net increase, offsetting a large decline in the US. The Asia Pacific region now accounts for more than two-thirds of global output. Coal consumption increased by a below-average 2.5%. 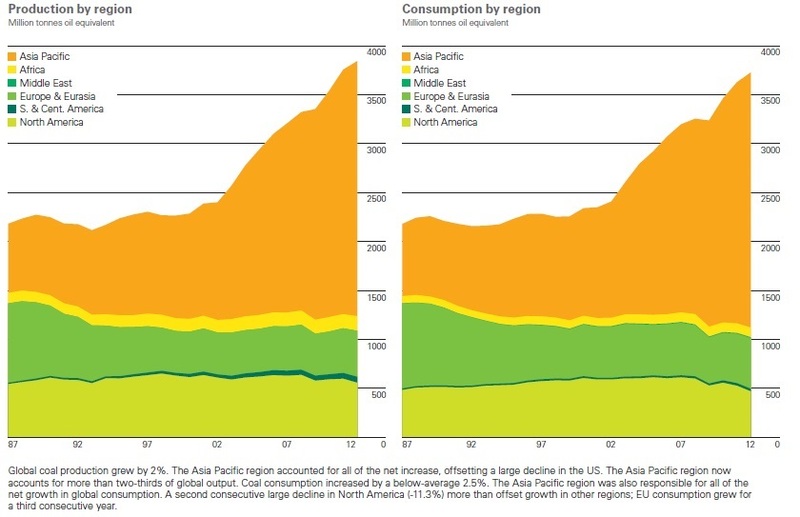 The Asia Pacific region was also responsible for all of the net growth in global consumption. A second consecutive large decline in North America (-11.3%) more than offset growth in other regions; EU consumption grew for a third consecutive year." It appears that North America is finding ways to substitute natural gas for coal on the margin, which is clearly a "win" for the environment. 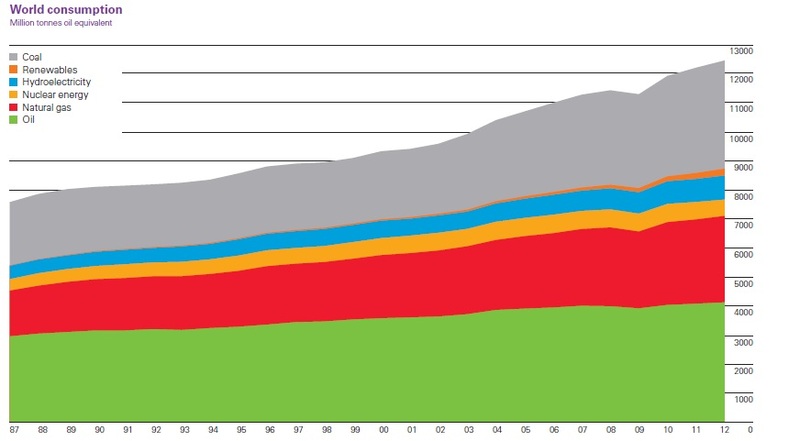 Finally, here's an image of overall global energy consumption since 1987. 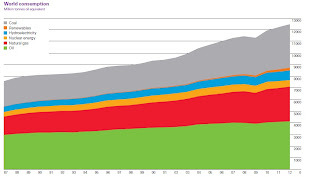 As the report summarizes: "World primary energy consumption grew by a below-average 1.8% in 2012. 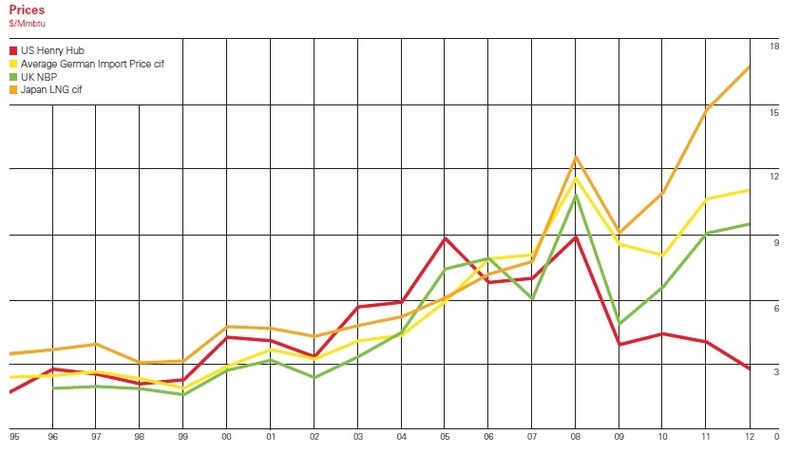 Growth was below average in all regions except Africa. Oil remains the world’s leading fuel, accounting for 33.1% of global energy consumption, but this figure is the lowest share on record and oil has lost market share for 13 years in a row. Hydroelectric output and other renewables in power generation both reached record shares of global primary energy consumption (6.7% and 1.9%, respectively)." I would also note that while percentage gains in renewable energy sources can appear large from their very small starting point, they remain a tiny part of overall world energy consumption.